Lecture Capture is any technology with the ability to record (or capture) lecture content and make it available in digital format (on-demand or live) for students. Many lecture capture systems offer three important benefits: the students can review recorded lecture content when they miss class, the content can be reviewed for exams, and content creation is simplified for online courses. Lecture Capture technologies and services have advanced rapidly over the years, creating an arms race in the lecture capture market and increasing the price and complexity of lecture capture solutions. Unfortunately, these “advancements” have totally priced many organizations out of the market, and many more are unable to fully deploy a lecture capture system across their entire organization. The Ensemble lecture capture solution is disruptive. Why? Because it is powerful, simple and affordable. Our goal was to build a very cost-effective lecture capture technology that can be deployed in every classroom on a campus, whether large or small. Ensemble Studio is a lecture capture recording and scheduling system. It integrates room-based video capture hardware, enabling easy, automated recording in classrooms, meeting rooms, labs, courtrooms, and medical training rooms. 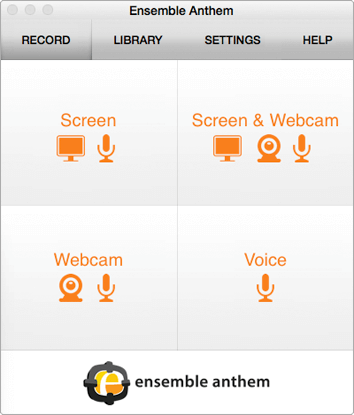 Ensemble Anthem is a software screen capture solution. It enables users to create screen, webcam and audio recordings wherever and whenever you want. Both offerings are affordable when compared with other lecture capture systems. Ensemble Studio makes the lecture capture process hands-off and automated. Once a lecture capture has been scheduled, the recording will start and stop at the scheduled times; the faculty member will not need to start or stop the recording. The presenter and anything displayed on the projector screen during that time will be recorded. Ensemble’s publishing tools will automatically route the lecture to your learning management system (LMS). Keep in mind, Ensemble Video recordings can be embedded in ANY LMS, and we have direct integrations with Blackboard, Moodle, Canvas, BrightSpace by D2L or Schoology. Ensemble Studio provides both a live option (streaming), which enables viewers to watch the presentation as it happens, and an on-demand option, which enables viewers to watch the presentation at a later date and time. By default, all live presentations are converted to on-demand presentations once the event has concluded. Ensemble Studio uses the Matrox Monarch LCS (and Matrox Monarch HD) to record and/or stream the classes or events. The Matrox Monarch LCS is an affordable, high-quality recording device that enables dual-input lecture capture (Picture-in-picture or Side-by-side). Complex and expensive recording equipment is no longer required to effectively capture classroom presentations in lecture halls, classrooms, and seminar rooms. Many instructors want to be able to create videos anytime, anywhere. Ensemble Anthem is a simple software lecture capture tool (Windows or Mac) that allows anyone to record voice, video and visual-aids from their own computers (or classroom computers). Once a user has finished a screen capture, it is automatically uploaded into an Ensemble Video library and published to an LMS. The recording can be accessed on-line from devices such as smartphones, laptops and desktops. The nice thing is that instructors decide how they would like their recordings published; recordings do not have to be automatically published to their LMS. Finally, instructional technology professionals can take advantage of Ensemble Anthem. They can make customized video recordings and training videos to get stakeholders up to speed on new learning tools and techniques. We see many of our support professionals using Ensemble Anthem to provide quick how-to videos. Whether your courses are online, on-campus or hybrid, recording class lectures will enable your students to review material at their own pace for better understanding. Lecture recordings constitute a viable learning resource that complement, not replace, the classroom experience by giving students opportunities to review demonstrations, previous lectures and guest speakers, anytime and anywhere. The real question is can you afford to deploy it across your entire organization? Lecture capture tools like Ensemble Anthem and Ensemble Studio provide a major opportunity to enhance teaching and learning, and yes, you can afford it. Learn more about how Ensemble Videos’s disruptive lecture capture solution can help you enhance teaching and learning, go to www.ensemblevideo.com. Ensemble Video is a turnkey online video platform that streamlines video capture, video management, and video publishing. Ensemble Video enables hundreds of progressive organizations across the globe to deliver accessible media content any time, over a variety of networks. Discover the incredible value and power of our streamlined video capture, video management and video publishing platform!